Relive the thrill and suspense of the instant classic film, The Dark Knight Rises. The movie took the world by storm, and now it returns in the form of an epic online slot machine. Find out who will win the battle for Gotham in the legendary Dark Knight Rises Slot. After breaking records by becoming the ninth highest grossing film of all time, The Dark Knight Rises has arrived in the world of online casino games. Inspired by the DC Entertainment comic series and 2012 Warner Bros. film, The Dark Knight Rises Slot features Batman and the villainous Bane. The Microgaming software company developed the game through a license with DC Entertainment. The game includes the film’s main characters such as Batman, Bane, Catwoman, and Commissioner Gordon as well as video clips from the movie. In addition, the game contains 5 reels and 243 ways to win. Perhaps the only down side to this game is that it’s quite difficult to find casinos which provide credits to “Play for Fun” online. Brought to you by the Microgaming software platform, The Dark Knight Rises Slot Machine marks the epic conclusion to the Dark Knight Series. You may have played The Dark Knight Slot which precedes this one. Now experience the brand new graphics including an incredibly realistic 3D battle between Batman and his arch-nemesis, Bane. For this feature, game developers carefully analyzed actual fight sequences from the movie in order to recreate a realistic depiction in the game. Meanwhile, suspenseful music plays in the background and portrays the intensity of the film. The game also includes video clips from the film. The Dark Knight Slot Machine certainly sets the bar in terms of gaming graphics. 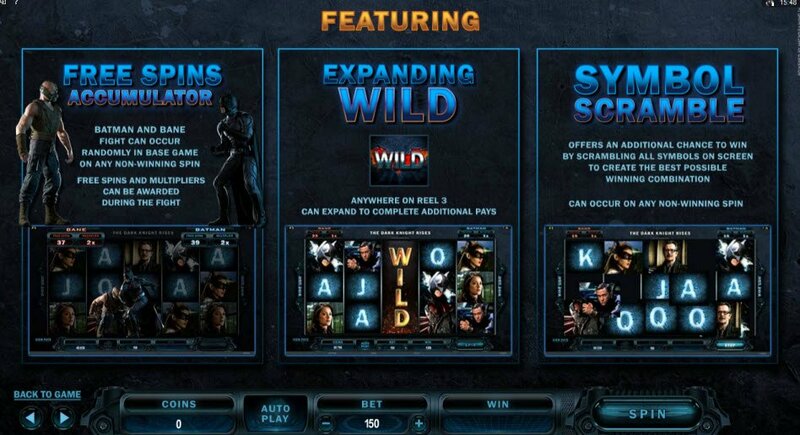 Not only does the Dark Knight Rises Slot come fully loaded with outstanding graphics, but also you’ll find a complete package of game features. The slot machine contains several bonuses including a Free Spins Accumulator, Expanding Wild, and Symbol Scramble. Not only does the Dark Knight Rises Slot come fully loaded with outstanding graphics, but also you’ll find a complete package of game features. 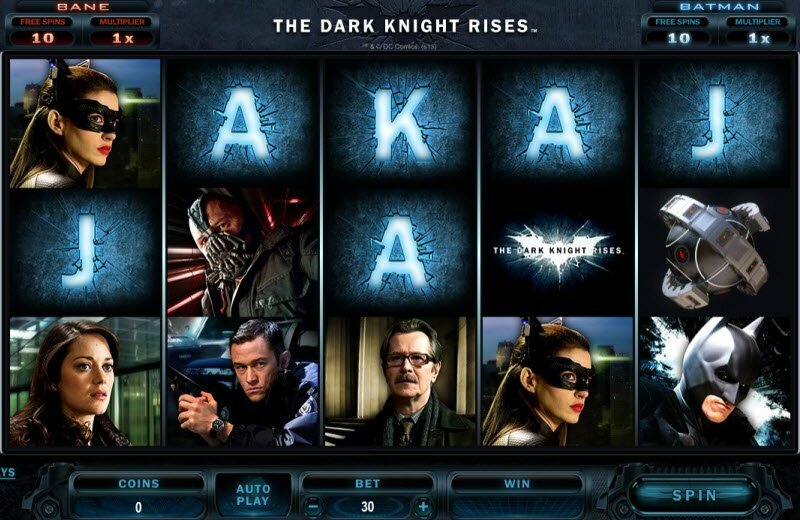 The slot machine contains several Dark Knight Rises Slot bonuses including a Free Spins Accumulator, Expanding Wild, and Symbol Scramble. During the Expanding Wild Feature, the Wild Symbol stretches across the entire third reel to increase chances for winning combinations. Lucky players who trigger the Symbol Scramble Feature will receive an additional chance to win by scrambling the symbols on the reels to create the best potential winning combinations. During the Fight Mode Feature, Batman faces off against Bane for Free Spins and Multipliers. The Fight Mode randomly triggers during the game and the more it occurs, the larger the accumulative wins will grow. In order to redeem awards collected during the fight mode, the player must access the Free Spins Feature. The Free Spins Feature activates when three or more scatter bombs appear on the reels. The player can choose between Batman or Bane’s rewards. 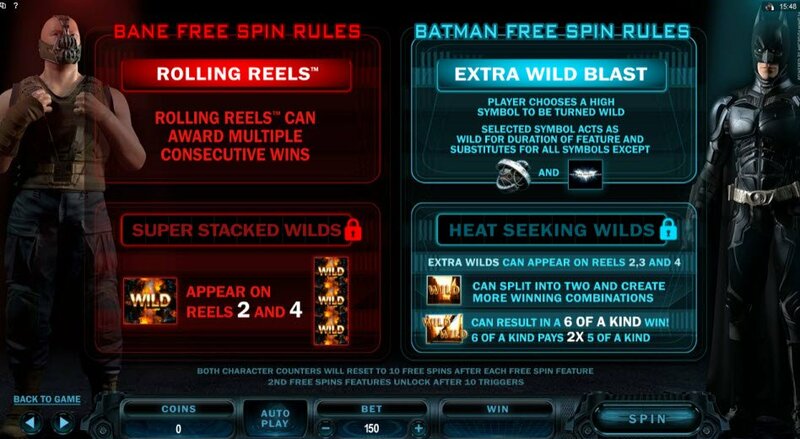 The Bane Free Spin awards Rolling Reels and Super Stacked Wilds while the Batman Free Spin features Extra Wild Blast and Heat Seeking Wilds. Bottom Line: The Dark Knight Rises Slot includes an impressive package of Bonus Features.